In the gadget-world, it’s cliché to compare something to The Jetsons. But when it comes to a cheap little box that you talk to and that answers your questions and that controls your entire home, the comparison is just too perfect. The $50 Amazon Echo Dot and the $50 Google Home Mini are two such boxes. They’re not perfect gadgets, but they offer a lot for the money. Which one is more amazing? Good question, Elroy. 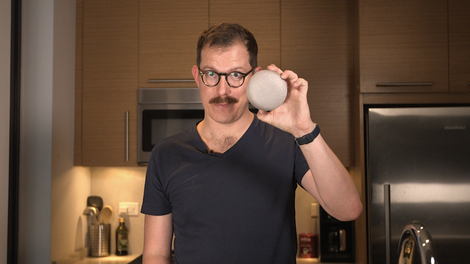 We ran the Echo Dot and the Home Mini through a litany of tests in an attempt to find out which cheap voice-controlled smart speaker provided the best smart home experience. Not only did we learn more about how Amazon and Google want to take over your lives. We also learned more about how to build a voice-controlled house without breaking the bank—and how to screw it up. So you want to turn your dumb home into a smart home. The first think you’ll probably buy is a smart lighting set. Philips Hue is a very good (and expensive) option, and it’s what I have in my home. It also works with Amazon’s Alexa as well as Google Assistant. That means you can an Echo Dot or a Home Mini to control your lights. The idea behind this test was to determine how dependably both smart speakers performed basic tasks like turning on the lights or adjusting their brightness. For the Home Mini, it was a breeze. After linking my Philips Hue system with Assistant in the app, simply saying, “Hey Google, turn on the lights” made the lights turn on. I was also able to dim them, brighten them, and turn them off without a glitch. Things didn’t go as smoothly for the Echo Dot. I had no trouble installing the skill in the Alexa app, but the voice commands just didn’t work consistent. I even tried variations of “turn on the lights” like “turn on the Philips Hue lights.” Somehow I got it to work a couple times during initial testing, but when we shot the video above, the Echo Dot simply could not turn on the lights. A quick Google search shows that others have had similar problems with Alexa and Hue, though there’s always a chance a fix is on the way. This is where things get more complicated. Both of these smart speakers are technically capable of playing music. However, unlike their larger siblings, the Echo and the Home, the tiny driver in each the Echo Dot and Home Mini is really designed to handle voice commands and responses. Music sounds pretty crappy on both devices. The workaround for the Echo Dot is super easy. There’s a 3.5-millimeter headphone jack that lets you connect a larger speaker for your music-blasting enjoyment. You can say, “Alexa play some Daft Punk on Spotify,” and Alexa will do just that. The Echo Dot also offers more music options that don’t use the headphone jack, such as compatibility with wireless speaker systems. Sonos, for instance, rolled out Alexa capabilities in October meaning you can install the new skill and then just ask Alexa to play any artist or song on Sonos. It works great and shows off the Echo family’s superiority over Google Home in terms of how many more skills and services work with Alexa. The Home Mini situation is less convenient. The device lacks a headphone jack but features Chromecast support. That means you can get the Home Mini to throw the audio over to a speaker with Chromecast Audio or a TV with a Chromecast and get that big sound. Of course, you’ll have to buy a Chromecast or Chromecast-enabled device to do it. Which is lame. On top of all that, Google Home also currently doesn’t work with Sonos. We expect Assistant to gain more skills in the months and years to come, but for now, there are some limitations. In my mind, a voice-controlled TV is the lazy man’s living room dream. No remotes, no getting off the couch, just pure stationary fun while you yell to change the channel or play a movie. Both the Echo Dot and Home Mini make this dream a reality—sort of. Let’s get the big asterix out of the way: in order to control most TVs, you’ll need a separate home hub. I have a Logitech Harmony Elite with accompanying hub, so this part was easy for me. If you don’t have a hub, there’s a chance you could gain some TV control through a Chromecast, but my efforts largely failed so I wouldn’t get your hopes up. Using the Harmony hub and app, I was able to set up some basic “Let’s watch TV” routines that I could then activate with either the Echo Dot or the Home Mini. That said, the routines I tried largely amounted to turning on the TV and opening an app, so I’d have to use the remote to pick a movie or show. Chromecast, however, offered yet another workaround. I could use a routine to turn on the TV and then find the Chromecast. This worked nicely for both the Echo Dot and the Home Mini. From there, I could request something on YouTube, something like SNL or viral sensation “spookin in the wrong neighborhood.” With the Home Mini, it works like magic. With the Echo Dot, not so much. Truth is, the $50 Echo Dot and the $50 Home Mini are more alike than they are different, which makes it tough to determine a clear winner. The extent to which you’d buy one over the other also depends on your current setup. If you already own and love an Amazon Echo, the Echo Dot is extra appealing. If you’re a Google Home household, the Home Mini makes good sense. Still, there are upsides and downsides to both devices. And there is a winner. It’s the Google Home Mini. The Home Mini doesn’t just have better software and a better design. It’s also easier to use and customize. While there are drawbacks, like the lack of a headphone jack, the Home Mini is bound to keep getting better as Google expands its presence in the smart speaker arena. If you’re an Amazon-fanatic, you’ll probably ignore me and keep buying Echo products. Good luck with that. The original Echo was the first and only king of the smart speaker universe, but now, there’s finally some good competition. Jeff Bezos can’t win all the time.